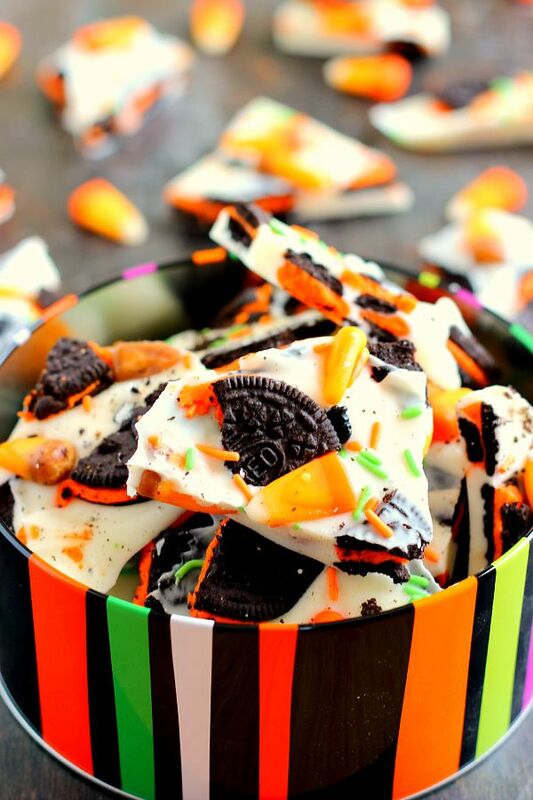 This White Chocolate Boo Bark is is filled with creamy white chocolate, Oreo cookies, and chewy candy corn. 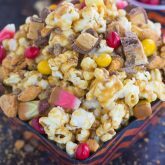 It’s so easy to make and is the perfect snack to munch on during Halloween! We’re just about into the last week of October, which means that Halloween is almost here! I look forward to Halloween every year because I love passing out candy to all of the trick-or-treaters in my neighborhood. There are so many cute costumes, that I eagerly open the door and usually pass out way too much candy to each kid. In fact, last year I ran out of candy in just under an hour. And I bought two big bags! Lesson learned for this year: go easy on the candy. After all, the kids are trick-or-treating all over the neighborhood, not just at my house. But back to the candy, do you love picking it out as much as I do? I’m kind of picky on what I choose to pass out, the main reason being because I always stash aside a little pile for myself. And I’m all about picking out the variety packs, but it has to include Reese’s peanut butter cups. That’s a necessity. And bonus points if Baby Ruth’s, Snickers, and M&Ms are in there, too. Luckily, I found the perfect variety pack of candy this year and am doing my best to not open it before next week. The main reason why I can resist the chocolate is because of my latest (and greatest) candy creation. 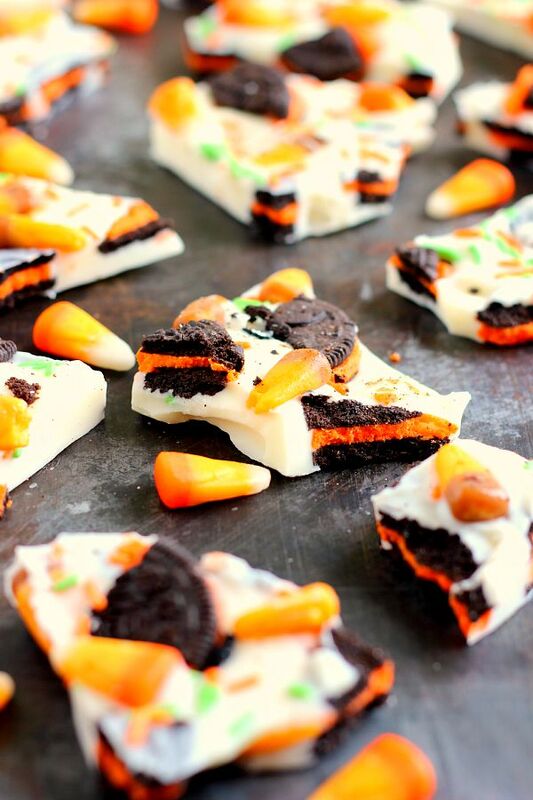 This White Chocolate Boo Bark is is filled with creamy white chocolate, Oreo cookies, and chewy candy corn. It’s so easy to make and is the perfect snack to munch on during Halloween. And this White Chocolate Boo Bark was made just you (and me) which means that no sharing was needed. That’s right, the trick-or-treaters get the store-bought candy and I get to snack on this homemade version. I’d say this is a win-win situation right here. One of my very first blog posts (please excuse the not-so-pretty pictures) was this caramel toffee bark and it became extremely popular on Pinterest. I haven’t made another bark since then, so I thought Halloween was the perfect time to create a festive version. And this White Chocolate Boo Bark does just the trick! With just four ingredients, you can have this treat prepped and made in about 10 minutes. Doesn’t get much better than that, right? And the best part about this White Chocolate Boo Bark (besides the delicious taste) is that it’s easy to change it based upon your tastes. If you prefer milk chocolate, use that instead! Don’t like candy corn? Swap it out for your favorite type. See what I mean? It’s the best kind of goody for everyone. But, please, add the sprinkles, it’s just more fun! 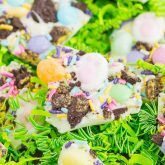 So if you’re enjoying Halloween out ‘n about or are just relaxing, you need this White Chocolate Boo Bark in hand. It’s so good that you’ll be making it all year long! 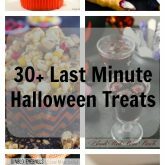 Looking for more Halloween treats? I’ve got you covered! Line a 13 x 9 baking pan with parchment paper, making sure that extra paper hangs over the sides for easy lifting once chocolate is hardened. Place about 3/4 of the chopped oreos and candy corn onto the prepared pan. Set aside. In a medium bowl, microwave white chocolate until fully melted and smooth, stirring every 30 seconds so that chocolate doesn't burn. Once chocolate is melted, pour over toppings in pan. Gently press in the remainder of cookies, candy corn, and sprinkles. Place pan into the freezer to harden for 30 minutes (or into the refrigerator for one hour). Once ready, lift parchment paper by overhang and set on counter. Chocolate will lift right out of paper. Break into large pieces by hand or using a knife. Bark will keep in an air tight container for up to one month if left on the counter, or will keep in the refrigerator for several months. This bark is easy to adjust to your tastes, so feel free to swap out the white chocolate with dark chocolate, add pretzels, different cookies, etc. So cute! Only calling it Boo Bark would make it cuter. Giant chunks of Oreo in chocolate is pretty much my bag, Gayle. Nice! How fun! This bark is PERFECT for the holiday! I need to bring snacks into both of my older boys' classrooms next week. I think this needs to go on the list! Thanks, Blair! I'm sure those kids would love this! I'm a sucker for white chocolate, too. Thanks, Sarah! Thanks for the kind words and pin, Catherine! This is so adorable!!! And I happen to be a giant fan of white chocolate and oreos and sprinkles....so yeah I would inhale this. Thanks for the kind words, Nicole! This bark is so fun for Halloween! It would be a blast to make with my nephews! I know I would surely enjoy munching on it! Thanks, Jen! It's so easy to make and so delicious! Boo Bark! Hahaha! That's perfect for this white chocolate treat! I love all the colors and I totally wouldn't share! My trick or treat candy always has to have Reese's pb cups too! How cute!! This is as fun a Halloween treat as they come! Love it, Gayle! This bark looks so cute! I'll definitely make it! Great idea Gayle! Thanks, Mira! It's such a fun treat! Boo bark! Goodness me what a fun name!! I havent' made bark in far too long - I need to do this with my leftover candy! Happy weekend Gayle! Thanks, Ashley! It's so perfect for all of that leftover candy. Hope you have a great weekend! My sister and I were just talking about how we want to have a little Halloween pumpkin carving party on Sunday. And watch Hocus Pocus of course. 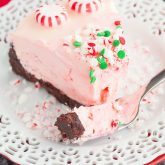 This will be the perfect little treat to make! Hocus Pocus is my FAVORITE Halloween movie, Natalie! I'm so excited that it's on TV on Sunday, even though I own the movie. It's one of those movies that I always have to watch whenever it's on! So fun! Love all the add ins and the colors! this looks so festive Gayle, very cute! This is the cutest stuff ever! I love it! Cute and yummy :). Pinned! Thanks, Annie! It's fun to experiment with the flavors! Wow, what festive colors! Fun! Thanks for the Halloween love, Michelle! 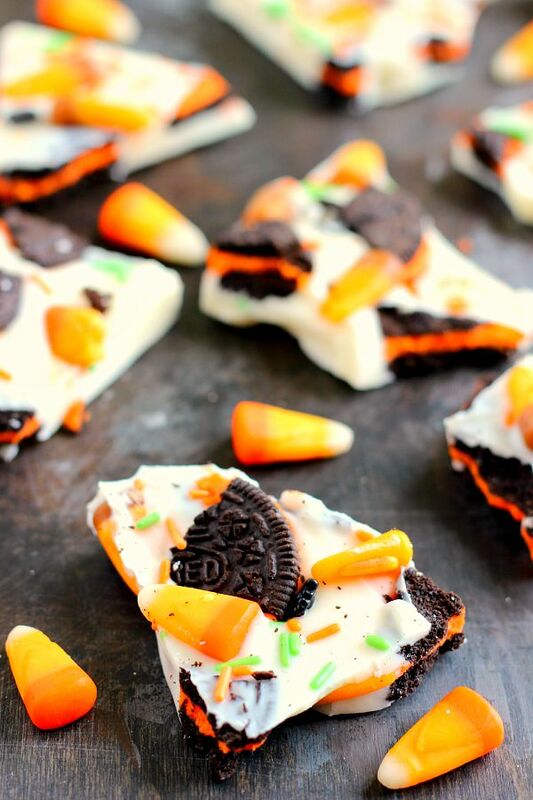 I love barks, and this is so great with the Oreos and all the Halloween fun! The colors are so festive and this would be great for a Halloween party! I love these!! All the leftover candies will be going into a bark for sure. This bark is so fun and festive, Gayle! 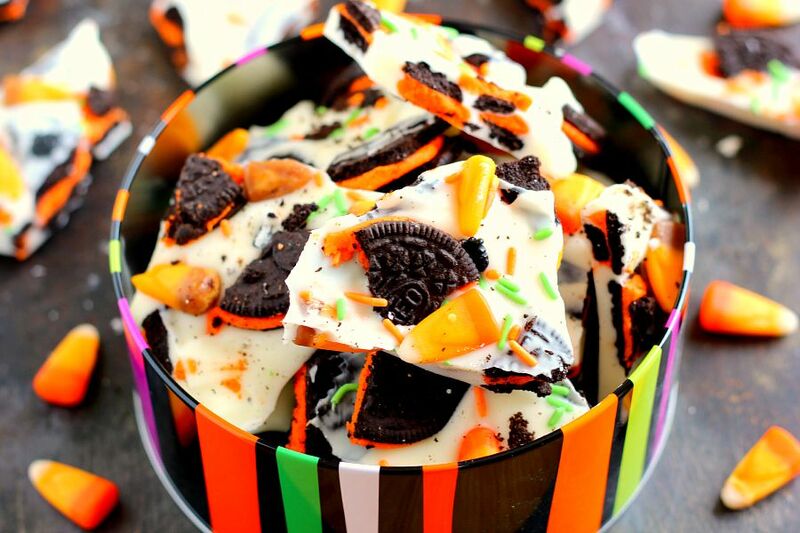 I love the white chocolate with the Oreo cookies and candy corn! It's perfect for snacking on while watching some scary movies and handing out the goodies! I seriously love the name of this recipe Gayle! So adorable! It looks delicious too and the perfect treat for halloween. Thanks for the kind words, Keri!